Australia’s World Cup preparations collapsed into chaos today when New Zealand scored 350 for nine to win the third Chappell-Hadlee one-dayer by one wicket and sweep the series 3-0. The forthcoming World Cup provides a great challenge and opportunity for his team members as it was the pinnacle of one-day cricket in the world and is a quadrennial event, India skipper Rahul Dravid said here today. Punjab’s juggernaut rolls on. Most of their batsmen are in form and their bowlers have also not been found wanting. Already sitting on top of the table, Punjab again notched up a convincing victory over Himachal Pradesh today to qualify for the knock-out stage of the Ranji Trophy one-day championship. Virender Sehwag failed with the bat once again, out for a first-ball duck, but Delhi faced no problems in overhauling Services’ meagre target of 112 by eight wickets in the North Zone Ranji Trophy one-dayer here today. Viswanathan Anand won an engrossing game against Norwegian Magnus Carlsen and jumped in to joint lead along side Vassily Ivanchuk of Ukraine after the end of the third round of Morelia-Linares chess tournament. Reigning champions Australia, also the World Cup holders, start as favourites in the four-nation women’s cricket tournament to be held here from tomorrow to March 5. Balwinder Kaur, who originally hails from Beas in Punjab, has done India proud by playing for the nation in the junior Asian Basketball Championship held at Bangkok from January 28 to February 5. At the championship, Indian girls won all six matches in the lower pool for the first time. India defeated Malaysia, Thailand, Sri Lanka, Kazakhstan, Vietnam and Hong Kong. After having topped the lower pool, India has now qualified for the upper pool. In the next championship, the Indian team will play against Asian basketball giants. Chennai Veerans outclassed Bangalore Lions 3-0 in the second edition of Premier Hockey League III at the Sector 42 Hockey Stadium here today. The Veerans dominated the proceedings right from the word go scored two goals in a span of two minutes. Their striker Suresh Kumar displayed scintillating performance, ably supported by skipper Adam Sinclair and Spanish import Albert Casas in the attack. 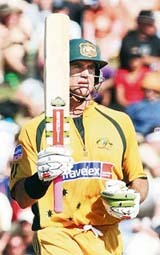 Matthew Hayden made 181 not out, the highest score by an Australian batsman in one-dayers, as Australia amassed 346 for five after batting first. But New Zealand lifted themselves from 41 for four to reach the target with three balls remaining. Hayden batted for most of his unbeaten innings with a broken toe which added him to a growing Australian injury list ahead of the World Cup which already includes Brett Lee (sprained ankle), Andrew Symonds (torn bicep) and Michael Clarke (injured hip). Hayden reached the eighth-highest total by an individual batsman in ODIs with 11 fours and 10 sixes but his effort was trumped by Craig McMillan, who scored a century from 67 balls, the fastest by a New Zealander in one-dayers. Australia have now been beaten twice by England in the finals of the tri-series and three times by New Zealand in the Chappell-Hadlee series — by 10 wickets, five wickets and one wicket. The 10-wicket loss was the heaviest in Australia’s limited-overs history and New Zealand’s last two wins involved two of the four largest successful run chases in ODIs, all of which Australia have lost. Australia lost to South Africa in Johannesburg last year after scoring 434 for four — then the highest total in the history of limited-overs cricket — and have since lost three times to New Zealand after scoring more than 330. Australia made 336 for four in Auckland on Sunday and lost by five wickets with eight balls to spare, lost in Christchurch last year in a similar run chase and were beaten today after posting a third massive total. In each case, the ineptitude of Australia’s bowling attack was the key factor of the match and Australia now head to the World Cup with their confidence in tatters and their No. 1 world ranking conceded to South Africa. Hayden shared partnerships of 122 with Shane Watson (68) for the first wicket, 88 with Brad Haddin (38) for the second, and other productive partnerships with Mike Hussey, Brad Hodge, Cameron White and Adam Voges as Australia scored at 6.92 runs per over. Their position seemed impregnable, particularly when New Zealand lost Stephen Fleming for 9, Lou Vincent for 11, Ross Taylor for 11 and Scott Styris for 0 to slump to 41-4 after 9.1 overs. But McMillan smashed 117 runs from 96 balls, Peter Fulton made 51 and Brendon McCullum steered New Zealand home with a brilliantly managed innings of 86. New Zealand whitewashed Australia in an ODI series for the first time and increased Australia’s anxiety ahead of the World Cup. “It’s out of this world,” McCullum said of the win. McMillan’s superb innings, and his partnerships of 75 with Fulton and 165 with McCullum, turned the match in New Zealand’s favour. They scored at more than seven runs per over through the first half of their innings and left themselves a run rate of less than a run and ball through the crucial closing overs. McCullum managed the strike and took his 86 runs from 91 balls with five fours and two sixes. New Zealand entered the last over needing seven runs to win but McCullum smashed a six from Nathan Bracken’s first ball to make the win academic. He was helped late in the innings by Mark Gillespie, who hit 28 runs from 15 balls. Jeetan Patel, who was the last man in, didn’t face a ball. Hayden’s 10 sixes were a record for an Australian batsman in a one-day match, surpassing Ricky Ponting’s nine, and there were 33 sixes in the match, also a record in one-dayers. Fall of wickets: 1-122, 2-210, 3-251, 4-279, 5-302. Bowling: Tuffey 10-0-68-1, Franklin 10-0-43-0, Gillespie 10-0-83-2, Patel 10-0-70-2, Styris 8-0-52-0, McMillan 2-0-28-0. Fall of wickets: 1-23, 2-34, 3-38, 4-41, 5-116, 6-281, 7-285, 8-303, 9-339. “It’s an exciting opportunity and a great challenge for us as it’s the pinnacle of one-day cricket in the world. We will try and give our very best which comes once in four years. Everyone in the team is excited”, Dravid said at a function to launch the Indian team’s new light blue clothing. Dravid said it was a relief in some ways that the mega event was close at hand after the reams of newsprint and bytes that have been unleashed by the media in the build-up. “In some ways it’s a relief that the World Cup has finally arrived after the amount of discussions that have taken place on television and in the newspapers over the last several months which is understandable in a World Cup year. We are finally going out and performing on the field,” he said. Dravid said captaining the team had been an exciting experience for him over the past 16 to 18 months and added: “I’m sure Sachin (Tendulkar) and Sourav (Ganguly) will agree (with his views).” The two former captains were present with Dravid at the unveiling of the new team clothing along with Mahendra Dhoni, Zaheer Khan, S. Sreesanth and Dinesh Karthik. The BCCI’s apparel sponsors Nike claimed that the new apparel that the team would be wearing at the mega event in the West Indies was 15 per cent lighter than the earlier one and was also capable of keeping the body temperature down to comfortable levels. The team’s new jerseys were manufactured after interactions with the Indian players over the past six months, said an official spokesman for the sponsors at the media conference to unveil the apparel. “The clothes would help in improving comfort levels and performance for the players as they won’t stick to the skin because of sweating. The engineered mesh at the back of the jersey and under the collar enables better breathability in the high sweat zone,” he explained further. The long-awaited players’ contracts will be implemented after the Indian team’s return from the March 13-April 28 World Cup in the West Indies. here today, the BCCI said in a media release. from the ICC Cricket World Cup 2007. “At the meeting today, the draft agreement was discussed in detail and the views of the board and the players were exchanged,” said BCCI Secretary Niranjan Shah in the release. Present at the meeting along with Shah were BCCI Vice-President Lalit Modi, former board chief I.S. Bindra and BCCI’s Chief Administrative Officer Ratnakar Shetty. In their penultimate match for North Zone against Himachal Pradesh at the PCA Stadium here, Punjab dished out another clinical performance, brushing aside their rivals by seven wickets. Former India player Dinesh Mongia supplemented the bowlers well with an impressive knock of 97 runs as Punjab, chasing a modest total of 167, overhauled the target in 38.3 overs with the loss of three wickets. Mongia was in great touch today. Unleashing 14 boundaries, he virtually toyed with Himachal bowling attack. The left-handed batsman was unlucky to lose out on a well-deserved hundred. He was run out when batting on 97. Skipper Pankaj Dharmani played a patient knockand supported in-form Mongia to finish unbeaten on 44. Seamer Ashok Thakur bowled his heart out and claimed two wickets for his persistence. It was a futile toil by the rest of the bowlers as the hosts cantered home with a bonus point. Earlier, seamer Gagandeep Singh bowled a superb spell and took four wickets to restrict Himachal to 167. Left-arm spinner Bipul Sharma also impressed with a miserly spell scalping two wickets for 23 in his 10 overs. Paras Dogra waged a lone battle for Himachal. In fact, it was Dogra who batted with application and saved Himachal from a humiliating situation. A patient Dogra batted for 151 minutes to score 55 runs. Fall of wickets: 1-7, 2-44, 3-110, 4-112, 5-112, 6-129, 7-140, 8-141, 9-142. Bowling: Gagandeep 10-1-20-4, V.R.V 8-1-57-0, Uniyal 8-2-20-0, Ishan 10-1-37-2, Bipul 10-0-23-2, Mongia 1.5-0-6-1. Fall of wickets: 1-7, 2-22, 3-160. Bowling: Ashok 7-2-16-2, Vikramjit 10-0-43-0, Mehta 5-0-32-0, Bhatia 7-0-37-0, Sarandeep 9.3-0-33-0. Debutant Pradeep Sangwan (4-43) and experienced Ashish Nehra (3-16) combined to wreck the Services, bundling them out for 111 before skipper Mithun Manhas (55) and Shikhar Dhawan (41) achieved the target in 28.4 overs. Services’ total could have been even lower had it not been for a face saving final wicket partnership between Tahir Khan (49 not out) and tail ender Pankaj Kumar (33) who produced 56 runs between them. Services’ decision to bat first backfired as they lost both their openers, Imran Khan and Amitpal Singh, for a duck. Both fell to Nehra. After the twin early blows by Nehra, Sangwan ploughed through the middle order as Services were reduced to a humiliating score of 9-55. Services were eventually all out in 32.2 overs. Four of their batsmen were out without scoring and two other made just one. Delhi started the chase badly with Sehwag falling to Fazil Mohammed off the very first ball of the innings, caught at second slip by Jasvir Singh, and Rajat Bhatia too falling for a nought. Asked about Sehwag’s form, Delhi’s coach Chetan Chauhan said every batsman went through such a slump in his career. “I remember this even happened with Sunil Gavaskar, who was technically so sound, in a particular series. He (Sehwag) needs our support,” Chauhan said. LUDHIANA: Jammu and Kashmir skipper Kavaljeet Singh’s fine innings of 60 runs went in vain as they lost to Haryana by 36 runs in the North Zone Ranji trophy one-day league match played at Punjab Agricultural University ground here today. Batting first, Haryana scored 234 for eight in 50 overs. Their innings revolved around Sachin Rana and Vishal Sahni who contributed 42 and 38 runs, respectively. 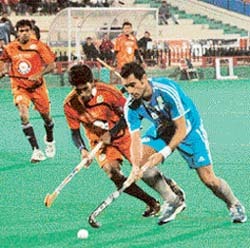 Other notable scorers were Sandeep Singh (34) and Sumit Sharma (24). Then they restricted Jammu and Kashmir to 198 runs in 47 overs. The main wicket taker was Amit Mishra who captured four wickets for 43 runs while Jitender Billa chipped in with three wickets after conceding 35 runs. The victory was especially sweet for Anand as it came with black pieces. After two draws in the first two game, the Indian took his tally to 2 points out of a possible three and is expected to come firing on all cylinders in the next round game against Russian Alexander Morozevich after the first rest of the marathon 8-players double round-robin event. Following the course of the first two days, there was only one decisive game in the third round as well as the other three duels ended in draws in contrasting fashion. Top seed Veselin Topalov of Bulgaria could do little against well-prepared Peter Leko of Hungary, Ivanchuk had little to worry against Peter Svidler of Russia, while defending champion Levon Aronian of Armenia could not find as many holes as he might have liked in a wild game against Morozevich. As things stand Anand and Ivanchuk have two points apiece and Leko, Svidler, Aronian and Carlsen follow them half a point behind. Topalov and Morozevich are sharing the last spot in the category-20 event with 11 rounds still remaining. Anand was in his element against Carlsen, who had been quite impressive thus far in the event. The Indian ace restored faith in the Semi Slav defense with his black pieces and equalised quite easily after Carlsen went for a harmless variation. The game took a decisive turn after the trade of queen on the 17th move as Anand got a miniscule advantage that remained to be nurtured. It was here that Anand came out with his best technique, slowly paralysing white’s forces and forcing Carlsen to part with one pawn soon after the rook and opposite colour Bishop endgame was reached. The complexities remained but Anand made it all look too simple once on top. The game lasted 40 moves. Aronian-Morozevich was clearly the pick of the day apart from Anand’s game as both fought out a tactical battle arising out of a Queen’s gambit declined. Playing black, Aronian got two dangerous looking passed pawns on the queen after the dust subsided but Morozevich was quite on target with his counter active measures. Aronian eventually had to part with a piece but the position was already a draw. Leko played the Queen’s Indian defence against Topalov and it was quite a dull affair as the former got a balanced endgame and exchanged pieces at regular intervals to net a drawn opposite-colour-bishops endgame. Topalov continued for a while but soon realised the fortress by Leko was impregnable. Peace was signed in 39 moves. Ivanchuk opted for the Petroff defence against Svidler who played with white pieces. After the normal theoretical manoeuvres were blitzed out in the opening, Svidler came up with slightly better prospects after trading the queens but this one never really left the boundary of a draw. The 50-over a side competition, which would be the second edition, would also have in fray runners-up New Zealand, India and England, organising secretary U. Prabhakar Rao and Tamil Nadu Cricket Association joint secretary Dr G. Natarajan announced at a press conference here last night. India begin their campaign in the lung opener on February 21, against England at the M A Chidambaram stadium while in another match, the Aussie eves will take on their traditional rivals New Zealand at IIT-Chemplast ground elsewhere in the city. 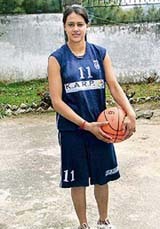 Balwinder Kaur, who originally hails from Beas in Punjab, has done India proud by playing for the nation in the junior Asian Basketball Championship held at Bangkok from January 28 to February 5. At the championship, Indian girls won all six matches in the lower pool for the first time. India defeated Malaysia, Thailand, Sri Lanka, Kazakhstan, Vietnam and Hong Kong. After having topped the lower pool, India has now qualified for the upper pool. In the next championship, the Indian team will play against Asian basketball giants. A few years ago, Balwinder was shaping up nicely in athletics as she was good in sprints, long jump and high jump. But when she shifted her school from Chamba to a government senior secondary school here a couple of years back, she thought of giving basketball a try. She impressed the selectors at the regional office of the Sports Authority of India here and soon switched to the new game. In September last, she was selected for the junior India girls basketball team. “She is a player you can rely on, especially in tight situations. She is a strong post player, who is very good with defensive rebounds. If the situation demands, she can be a good forward too,” said Neena Mehta and Durga Devi, Balwinder’s coaches. They said that Balwinder had played brilliantly against Sri Lanka and Kazakhstan and helped India win both matches. Chennai Veerans outclassed Bangalore Lions 3-0 in the second edition of Premier Hockey League III at the Sector 42 Hockey Stadium here today. The Veerans dominated the proceedings right from the word go scored two goals in a span of two minutes. Their striker Suresh Kumar displayed scintillating performance, ably supported by skipper Adam Sinclair and Spanish import Albert Casas in the attack. They took the lead in the 14th minute, when Suresh Kumar received a ball at the top of the circle and sent it to his left where unmarked Adam Sinclair deflected from close. Two minutes later, Albert made no mistake in executing another goal for the Veerans. At this juncture, it was again Services striker Suresh Kumar who did the spade work on the right flank before putting Adam in possession of the ball. Suresh sent a quick pass to Adam Sinclair who in turn relayed it to an unmanned Albert Casas. The Spanish star dodged the Bangalore goalie Bharat Chetri who could not anticipate the approaching striker’s action and the ball just slipped into the net. In the last minute of the third quarter, Chennai’s Suresh sealed the fate of the game. In this raid, it was Adam Sinclair who passed the ball to Suresh from the left flank where Suresh did not have to make much effort and just pushed the ball in 3-0 Suresh Kumar was later adjudged the Lion of the Match. The Chandigarh Dynamos versus Sher-e-Jalandhar encounter, which was postponed due to rain on February 11, will now be played on February 27 at 7 pm, according to Mr Shakeel Qureshi, tournament director. Consequently, some of the matches have been rescheduled. Two matches will be played on February 23 where Chennai Veerans will take on Sher-e-Jalandhar at 2pm while Orissa Steelers will play Maratha Warriors at 7 pm. Hyderabad Sultans versus Sher-e-Jalandhar and Chennai Veerans versus Orissa Steelers matches are advanced by a day and will now be played on February 25 and 26, respectively. There will no match on February 24.